With the arrival of iPhone 5, a new type of SIM card format landed in the market of the mobile telephony: the SIM 4FF (4th Form Factor) also well-known like Nano-SIM. The new card format SIM, proposed by Apple in May of 2011, has dimensions of 12,3 xs 8,8 xs 0,67 mm, which supposes a reduction of a 40% with respect to the size of Micro (or 3FF). The reason that the company of Cupertino adduced to promote the new format was the necessity of greater space available inside the housing of the terminals, with the aim of introducing new components. This argument already was used by Apple to adopt the format 3FF in iPhone 4, although then the difference between Mini (2FF) and Micro supposed a saving of almost 200 millimeters squared in a terminal that presented/displayed equal dimensions that its predecessor, iPhone 3G/3GS. Now, however, the space gain is of only 70 millimeters square (smaller than a nail of the finger meñique) whereas iPhone 5 is 500 millimeters square greater than iPhone 4/4S. This, together with the constant improvement of the processes of miniaturization of components, causes that somebody can be asked if were necessary to introduce a change in the format of the SIM. 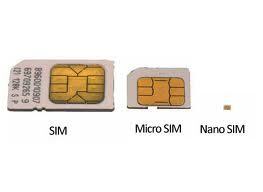 Then, which are the advantages of the Nano-SIM with respect to Micro? During the negotiations for the standardisation of the format 4FF, where there were three propose solutions (the other two came from Nokia and RIM), was decided on the format proposed by Apple on the basis of its greater facility to provide compatibility with the previous formats backwards. This compatibility would be provided by means of the use of simple adaptors, like which they are possible to be seen in the photography. Nevertheless, the format 4FF also presents/displays a series of disadvantages. And the first most important one comes derivative from the change of thickness of the Nano-SIM with respect to all the previous form factors. That change of thickness, of only 90 microns (0,09 mm), has brought about the necessity of a change in the process of manufacture of cards, as much in the plastic as in the own chip. It is possible to emphasise, in addition, that the new process of manufacture is exclusive of the Nano-SIM and nonre-usable for no of the previous formats. As a result a number of consequences are created ranging from supplying of raw material (Chips and plastics), complex production process of the card manufacturers, as well as the management of the orders on the part of the operators. In addition to this, there is the need for specific machinery and of greater technological complexity for plastics used and the encapsulation of the Chips. Another potential disadvantage that the present format of Nano-SIM has, it is the difficulty for his manipulation during the insertion and extraction of the card in the terminal. As a result of this limitation, next to the proposal of format of Nano-SIM the one of “a carrying” tray was included that facilitates its manipulation. It is tray she is very similar to which already was used in iPhone 4/4S, to manipulate Micro SIM card. At this point he is interesting to mention that Apple owns a clear one on these carrying trays, as much for the Nano-SIM as for Micro. Although it is certain that the company directed by Tim Cook has promised not to demand royalties to the manufacturers who use that solution for the Nano-SIM. It seems clear that the main consequence that has the arrival of the Nano-SIM is the introduction of a barrier for the change of terminal. The artisan adaptation of Mini or Micro to Nano-SIM cards. Although there are some users who teach to us how to do it in Youtube, doing use of a digital calibre and sandpaper of fine grain, agrees to see the video until the end and not to avoid the goodbye recommendation: “There is not to guaranty that this will work”. Jokes separate, are clear that the user will have to ask for a card change vice versa whenever changes of a terminal with Nano-SIM (so far only iPhone 5) any other, and. Everything with its consequent cost. The use of adaptors is a solution that could mitigate the problem partially, since the tried ones until now are only valid for a few uses. Surely this he is one of the reasons by which the adaptors have not been standardised along with the Nano-SIM.